Update on 3/22/16: This feature has been enhanced. Bounces are now detected automatically and bounced addresses are suppressed in future email campaigns. This is part of the new Automatic Reply Management feature. I just deployed a hack that lets you pull bounces from your Gmail account so that future GMass mail merge campaigns skip sending to those bounced addresses. 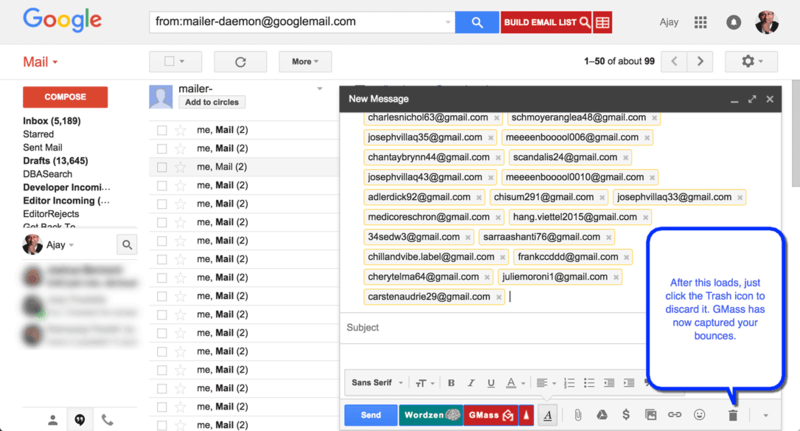 If you already have a history of sending mail merge campaigns through your Gmail account with GMass, you’ve likely accumulated some bounce-backs. You already get ridiculously high email delivery rates when using GMass, but avoiding repeatedly sending to bounced addresses will optimize your email delivery even further. 1. Use the Gmail search tool to search for “from:mailer-daemon@googlemail.com”, and then search. This will show all of the bounce notifications you’ve received. 2. Next, click the GMass “Build Email List” button. This process could take a few minutes to complete if you have a lot of bounces in your Gmail account. 3. After it’s done, a new message will launch with all of your bounced addressed in the To field. Simply discard this message by hitting the Trash button in the lower right corner. GMass has now captured all of your bounced addresses and added them to our internal database. Now, if you attempt to send to any of these bounced addresses, GMass will skip over them. In the future, we will automate the process of plucking bounced addresses from your account and adding them to our database, so that you don’t have to go through this manual process. Stay tuned for that. OK this works for all the from:mailer-daemon@googlemail.com but what about the others say mailer-daemon@yahoo.com, mailer-daemon@bigfoot.com or these postmaster@ziprealty.com…How do we get rid if these bounces? When you get bounces from yahoo.com or bigfoot.com, the bounces will still come "from" mailer-daemon@googlemail.com, so this technique will still work. I have a question. Can I remove the "bounced" addresses from the internal database? What happened to me: many emails got bounced, but from different reasons than that the target address does not exist. As far as I understand, now all these email addresses are blocked, even if I want to send to them in the future again. Can I manage the list of these addresses somehow? I have the same problem as Svatik79…. How can I remove bounce-mailadresses from the internal database? In a different situation, what happens if I create a normal campaign but then decide to trash the email. Will any of these contacts be inadvertently added to the no-send list? That is a great question, and that is sooooooooooo important. I was wondering the same thing. And i am worried that i have already done it and don’t remember. FOLLOWING. i cant't able to build a email list which is in the search tool. when i tried it replies like There was an Internal Server Error, likely caused by too many email addresses being found. Please narrow your search criteria. please help me to resolve it. Just checking to confirm that this is the latest “hack” or way to remove bounces from future email. How can i collect bounce emails in excel for removing it from my internal sheet. How do I REMOVE an address from the GMass “Bounce List”? I feel my “Bounce List” contains viable email address that should NOT have gotten on the Bounce List since my own is on the list and I cannot sent even a singular “Test” message to myself! !I need to be able to review the list and remove addresses that should not be there.